Steel rails are rigid and more economical, while flexible rails reduce replacement costs. Which fits your needs? In both cases, the guard rail has deformed. That’s good (kind of), because both guardrails have done their jobs and protected the people, equipment or facility structures behind them. On the other hand, you can see that the rail systems have been damaged. Let’s see how they match up in form, function and lifetime cost. Typically when you have a forklift barrier, it will eventually be impacted, and those impacts can be direct or indirect, fast or slow, serious or cosmetic. When the impact is direct, fast and damaging, what are the critical differences in rigid and flexible rail systems? How are steel guarding rails built and how do they work? Steel guard rail is the most widely used guard rail type. It has been around for decades, and has been the industry standard — the only choice — until a few years ago. The primary components of steel guard rail are the square tube steel posts (usually 3″x3″ or 4″x4″ and 42″ high for dual rail systems), base plates, and corrugated steel rails. Strength and impact resistance relies primarily on the thickness of the steel used in construction, the number of posts, and the number of rails. 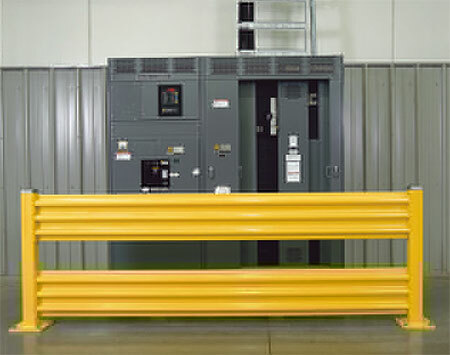 These rails can and do hold their own in the face of a forklift impact or other stress. Polymer based flexible guard rail systems install similarly to steel except that the posts are have a double layer – a steel post is inside the round poly post using a special mounting system that connects the metal and poly post pieces, providing rigid protection. The rails are attached by sliding them onto smaller diameter tension regulating stubs that stick out from the sides of the poly post pieces. How do these systems handle impacts? Steel guard rail is tough. It resists slight bumps and dings with ease. With more powerful collisions, there is potential for a loss of resistance in the metal strength. The steel guard rail stops the moving vehicle from crashing through the barrier it provides unless it has been struck too severely for the rail to maintain its integrity. Watch the video embedded here: you see that the steel deforms with a heavier, faster moving impact. It might have to be replaced in part or whole, and will certainly need to be repainted. The posts will need to be inspected for bending as well and possible replaced. Damage to the anchor points and floor surface is key. Since steel guard rail absorbs the full impact and transfers it to the floor, there is stress at the anchor holes. Over time, floor will be damaged until at some point it gives way and the guard rail is breached with the next impact. Site audits at facilities have shown some anchor points so damaged that you could wiggle the post back and forth freely. Conditions such as these are dangerous accidents waiting to happen. Whenever there is a collision significant enough to replace rails or posts, the anchor points need to be carefully checked for damage. Poly guard rail is durable in several ways. It doesn’t readily show scratches and dings since the color goes all the way through the poly pieces. The polymer is forgiving in collisions. Small impacts just bounce back immediately into the original shape. Because of that elastic quality, it flexes on heavier impacts, absorbing and deflecting all the energy of the collision instead of transferring it to the anchor points. The guard rail flexes as far as it needs to in order to dissipate the impact energy, then returns to its original shape. Additionally, the anchor points at the base plates are less affected due to the impact absorption, meaning your guard rail has a longer service life overall. Like all guard rails, flexible systems have a point of failure. Cost and return on investment – what’s right for you? Steel guard rail is available in a wide range of prices based on the quality, configuration and construction. It’s important to keep in mind the load weight, forklift speed, and density of traffic for any run of guard rail you plan to install. The faster, heavier and more crowded the traffic, the higher the risk of hitting and damaging guard rail. Heavy traffic patterns such as these require heavy-duty guard rail, such as Steel King’s Steel Guard system. For lightweight loads or speeds, a less robust guard rail or hand rail should be fine. There are no regulated impact standards in the guard rail industry, but we can assist you in specifying the right railing system for your application. You might have to replace sections of guard rail from time to time due to collisions, or deal with damaged floors and anchor points more often. However, given the cost difference, steel systems can be replaced more inexpensively than poly systems. 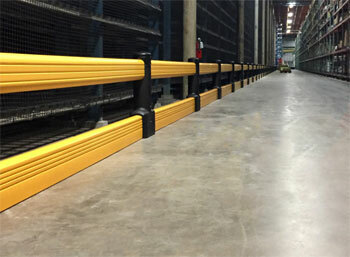 Flexible polymer guard rail is more expensive than steel guard rail. The return on investment accrues over time as you incur fewer damaged sections of rail and less money spent on replacement parts and floor repairs. If you already have steel guard rail, you should have a good idea of what kind of expenditure you’re experiencing (may be a little, may be a lot). You may be able to reduce that figure with flexible systems. The guard rail is yellow throughout, so it never requires paint. Flexible systems tend to reduce the overall cost of ownership over a period of time. Generally speaking, the higher the load weights, faster the speeds, the more replacement or repair costs you see, the case for flexible systems becomes stronger. It may be case where higher traffic areas and impact zones can mix the two systems, with poly rails in place for the most commonly hit areas. It boils down to your needs and your situation. Steel Guard and Flexible Poly systems are both excellent – and appropriate – for the right applications. Both do the job of protecting people and inventory and machines. While steel railing doesn’t absorb as much impact, it’s less costly and is extremely effective protection. Flexible poly rails are more expensive, but don’t transmit nearly as much force to the forklift, the rail, the posts, and the floor. Both types have their place in a forklift safety layout. If you aren’t sure, call us. we’ll help you plan layouts and provide you with specs and cost comparisons to help you make a decision. We’ll answer your questions, offer suggestions and help you specify and install the right solution for your needs.